← http://www.sci-hub.io – an end to copyright? Should you not believe that ISO standards are going to have to change to conform to sharia, check out p8ff of Hammoudeh’s book for a summary of how non-Islamic quality theories fall short. Unlike the average, dull accreditation fan, this author has thought about the philosophical assumptions of the quality cartel. He repeats the point made earlier in this blog that managerial inspectionism arises from a logical positivist worldview. The methodological and ontological assumptions of consulting are supposedly value-free. Management consultants charge a lot and leave their customers to make their own mistakes. UKAS, likewise, while it is obliged as a condition of its monopoly, not to offer consultation, also takes no legal responsibility for the mess it creates through inspections. The whole positivist approach is too American. It doesn’t worship Allah. Western mental models of quality are going to have to change. John Seddon’s criticisms are insufficiently transformative for the management ISO. All must be subjugated to Allah, Hammoudeh says. 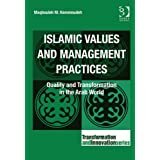 Islamic Values and Management Practices: Quality and Transformation in the Arab World (Transformation and Innovation) by Maqbouleh M Hammoudeh 28 Aug 2012. Submission to the ISO mentally prepares the way for submission to being standardised to sharia. Both have extensive belief-systems behind their rules and both exist to impose their own odd concepts of correctness on others. This entry was posted in Management, Philosophy, Politics and tagged coercion, Islam, ISO management standards, logical positivism, mind control, sharia. Bookmark the permalink.